The expansion of the Internet changed almost all businesses from the core. Not even the music industry could avoid being changed into a business powered by the social networks that connect music lovers from all over the world. In a good way, this shows that the Internet is here to empower and embrace all artists and those in the making. Although it was predicted by several online news portals on multiple occasions that the music industry would die due to the open nature of the Internet (meaning people will listen to music exclusively via YouTube or a streaming service like SoundCloud – both of which are completely free to use and will most certainly remain free for the time being), it’s still a living and breathing business that helps artists all across the globe in their mission to share their passion and get paid for the content they create. Music piracy was basically the thing that started this talk about a dying business model, but that’s not what this is all about. The sole ability to download songs, music videos, and recorded concerts over the Internet was the key in that story. In a way, it definitely is true when artists say they can’t earn money when all their fans do is download their songs and don’t pay for their CDs, but that’s just scratching the surface. Even though online music streaming services care about music artists and their copyrights, they just can’t protect their content well enough to prevent it from being downloaded and stored offline. And if that content truly was made impossible to download, for the fans scattered all over the globe, that would just mean a very bad approach was made by both the streaming service and the artist agreeing to those terms. So what’s the best solution to making money in today’s music industry? Well, oddly enough, complying with YouTube’s, Spotify’s, SoundCloud’s terms and conditions is a good thing to do, because by using those massively popular services, you, the music artist, will gain access to an incredibly wide audience – we’re talking over 1 billion registered YouTube users, almost 100 million Spotify Premium users, and about a half billion SoundCloud users who are actively looking for their next big hit. Another thing that might make the difference here is that those streaming services won’t cost you nearly as much in terms of your budget dedicated to self-promotion and general marketing as standard publishing houses require. This also means artists get to keep a lot more incoming sales money than their colleagues selling their content via music publishers, but the difficulty in this benefit is that it takes a lot of time for an artist to get to that comfortable stage. That’s why they reach out to music publishers that are there to kickstart their careers and enable them to go far and beyond with their music. With that said, what can artists and their chosen music publishers do to get their careers going? As always in the marketing world, the biggest obstacle for every single artist is to get the attention of their targeted audience in the first place. Yes, there is over a billion people who listen to music on a day to day basis, but the cost of advertising each new artist should be as high as paying for a huge billboard, right? Absolutely not! and even distribute your music to basically all of the biggest music retailers for no more than $100? Our record release planner also covers the marketing part, but with slightly more detail, so make sure you check that one out as well! Now that’s something the Internet created. The unique opportunity to make money in today’s music industry. That is something that has never been possible before, nor even imaginable just ten years ago. Artists now have the power. The power to focus their attention not just on creating their songs, but also selling their creations over the Internet – all at the same time. 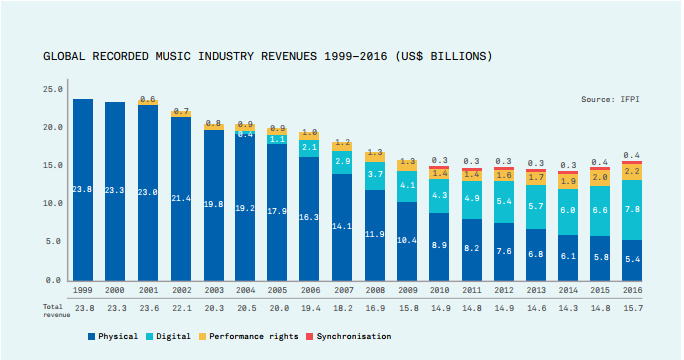 In the midst of the expansion of the Internet and its power, a 2013 Nielsen study on the music industry showed something not everyone was really expecting: although the music industry as a whole was going through a bad time in terms of making profits from their sales, a wide majority of fans are ready to give as much as 4 times more money than they usually did for merchandise sold by artists, their managers in charge, as well as the labels responsible for the published records. What this means is that fans are willing to pay more money if there only was an opportunity for them to buy more merchandise from their favorite artists. This inspired artists all over the world to improve on their marketing strategies and offer themselves and all of their exclusive content to their biggest fans much more than what used to be the practice in the past. The movement after Nielsen’s study launched a wave of artists selling personalized, signed CDs, albums with an exclusive bonus song or two, as well as copies of handwritten lyric sheets, all of which were available at a high price and at limited quantities. What were once city center fillers, live performances are something that market the past of the music industry as the best money earning method. It’s still a good method in today’s world, and its capabilities should not be underrated at any time. Unlike those mp3 files people download on their smartphones, a performance and its atmosphere just can’t be duplicated. “You simply have to be there to experience it.” That’s pretty much the reason live performances aren’t going anywhere in the near future. Fans of all genres of music have high demands for live performances and concerts, so the conclusion is: as long as there’s music, live performances and concerts will live to see at least another decade or two. Last, but not least, patronage support is a growingly popular way of music fans showcasing their support for their favorite artists. With the concept of paying a small monthly fee to an artist (which goes as low as $1 per month on Patreon), this particular market is growing in both size and revenue, year after year. This type of artist support is highly popular among YouTube creators, who are basically individuals and groups who produce content of good quality. They obtain a good number of followers, and to improve on their work, they offer more exclusive, behind the scenes content for their biggest fans. With this method, you are basically committed to finding innovative ways that will help you be a better performer, i.e. to deliver on what you promised to the fans willing to support you and your work each month. Music fans all across the globe have been reminding us time after time that the more exclusive content they get from their favorite artists, the more they will enjoy their music and pay for the enjoyment it brings. With this as our final confirmation to you about the music industry as an undying business model, we invite you to reassess your marketing strategy and your approach to your biggest fans, as they always will be your main source of income. And enjoyment. Commit your time and patience to online streaming services, as they are your main gateway for publishing and promoting your music. We at Supreme Tracks cover the recording bit so your demos get turned into master tracks ready for market success. With the expansion of internet came the new era for the music industry. In order to make it in music in today’s world, some things need to be done differently, especially if you are an independent artist trying to make a living from your music. Comply with YouTube’s, Spotify’s, SoundCloud’s terms and conditions and you will gain access to an incredibly wide audience. Promote yourself and your music online (website, social media, etc.). Distribute your music to all of the biggest music retailers. Make sure you have merchandise available for your most loyal fans. Don’t forget, live performance never goes out of style. Think about getting patronage support. I think the best way to make money from your music is to… treat your music as an asset over a commodity. Aside from the fact that you can make (some) money from streaming online, selling tracks, and doing live shows (music as “commodities”), I think music itself as an asset is the quickest way to create a brand, and brands sell. All is needed is an image to associate the music with, and, of course, the tenacity to promote your music, not as a commodity, but as a movement, and you have the potential for something that would go beyond what you’d possibly get from selling the music alone.